Here we show how filter selection for epi-fluorescence microscopes can extend their capabilities. 1. What are epi-fluorescence microscopes? The phenomenon of fluorescence occurs when a specific wavelength of light (excitation light) is absorbed by a substance, which gives off light when it releases energy as it returns to its ground state from the excited state. Many fluorescent substances (called fluorophores) have been developed for different uses, with excitation wavelengths ranging from the ultraviolet to the infrared. However, emission wavelengths are usually longer than the wavelength of the excitation energy which causes them. As shown in Figure 1, filter blocks are constructed from 2 types of filters and 1 dichroic mirror. Selecting appropriate filters and mirrors for each use allows researchers to attain a high signal to noise (S/N) ratio between the fluorescence and background light. The functions of these optical elements are described below. The excitation filter is the optical element that passes only the wavelength of light necessary for excitation from the excitation light source (usually a mercury lamp) to the fluorophore. As shown in Figure 2, only the excitation wavelength passes through the filter, usually a "band pass filter". The dichroic mirror is the optical element that separates the excitation light from the fluorescence. Dichroic mirrors are special mirrors that reflect only a specific wavelength of light, allowing all other wavelengths to pass through (Figure 3). Dichroic mirrors used in epi-fluorescence microscope filter blocks are placed in a 45?incidence angle to light, creating a "stop band"of reflected light and a "pass band"of transmitted light. Light passing through the excitation filter is reflected 90?toward the objective and the specimen. Finally, light emanating from the specimen is passed through and directed toward the observer (or high-sensitivity camera). Barrier filters are optical elements that separate fluorescence emanating from the fluorophore from other background light. As shown in Figure 4, the barrier filter transmits light of the fluorescence wavelength which passes through the dichroic mirror while blocking all other light leaking from the excitation lamp (reflected from the specimen or optical elements). This is necessary because the strength of the fluorescent light is weaker than the excitation light by a factor of more than 100,000:1. Most barrier filters are positioned at a slight angle to allow better fluorescent imaging by suppressing ghost images. Nikon's epi-fluorescence microscopes have a proprietary Nikon optical element called a �noise terminator? (on models TE2000 and later). As shown in Figure 1, the noise terminator allows efficient processing of light transmitted through the dichroic mirror by preventing the excitation light from scattering within the filter block and leaking into the observed image. This helps to eliminate background light noise and more effective fluorescent images. Ascertain the wavelength of the fluorophore in use. This information is noted in catalogs, but the wavelength properties of fluorophores also change slightly depending on solution conditions such as salinity, pH and intracellular conditions. Therefore, we recommend using a fluorometer to measure both excitation and fluorescence wavelengths. Then, use this information to select the most appropriate optical elements. The selected dichroic mirror must effectively separate the wavelengths of the excitation light and the fluorescent light. Specifically, a dichroic mirror whose transmittance cutoff lies between the fluophore�fs excitation wavelength and its fluorescence wavelength must be found by comparing the mirror�fs characteristic curve with the fluorophore�fs wavelength when the mirror is placed on a 45? incidence angle. If the fluophore's excitation wavelength and its fluorescence wavelength are close and the Stoke's shift (Note 1) is small, then a mirror with a smaller cutoff wavelength should be chosen to allow as much fluorescence signal to pass as possible. Select a filter that allows fluorescence wavelengths from the specimen to pass. Usually, long pass filters that transmit long wavelengths are chosen over band pass filters. However, a band pass filter that does not transmit these longer wavelengths is often used as a barrier filter when separating wavelengths from a multiple-stained specimen or when using a camera sensitive to longer wavelengths. Select a filter that allows excitation wavelengths to pass smoothly. Especially when a mercury lamp is used as the light source, efficient excitation is achieved by incorporating the line spectrum of the mercury lamp into the wavelengths. Allowing wavelengths other than the excitation wavelength of the target fluorophore to pass will both increase background light and damage the specimen. As shown in Figure 7, excitation efficiency is low for a wavelength of 440 nm. The ideal combination of barrier filters and excitation filters is one that lets no light pass when combined. The fluorescence emitted is very weak, so any light that leaks through the filters will reduce image quality. Sometimes it is recommended to remove the ND filter in the excitation optics and increase the strength of the excitation light source. However, increasing the strength of the excitation light source will bleach the fluorophore quickly and damage the specimen, as well as increasing autofluorescence (Note 2) in the cell. For these reasons, the light source should be kept as weak as possible and the observation optics made as efficient as possible in picking up the fluorescence signal (by widening the objective aperture, increasing the wavelength band of the fluorescence filter, using a more sensitive camera, etc.). Note 2: Autofluorescence refers to the presence of fluorescing substances in substances other than those generally defined as fluorescent. For example, cell components such as NAADPH or riboflavin give off relatively strong fluorescence in the short wavelength range (ultraviolet to visible) in unstained cells. You can take the following steps to reduce bleaching. Anti-bleaching agents such as P-phenylenediamine can be used for FITC, and n-propyl gallete can be used for rhodamine. 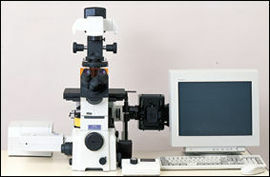 Use neutral density or ND filters on the microscope to reduce light levels to the minimum needed for observation. At times this may require setting the filter to 100%, while taking steps not to split the light path as much as possible. Use the most bleach-resistant fluorophore available for each testing purpose.